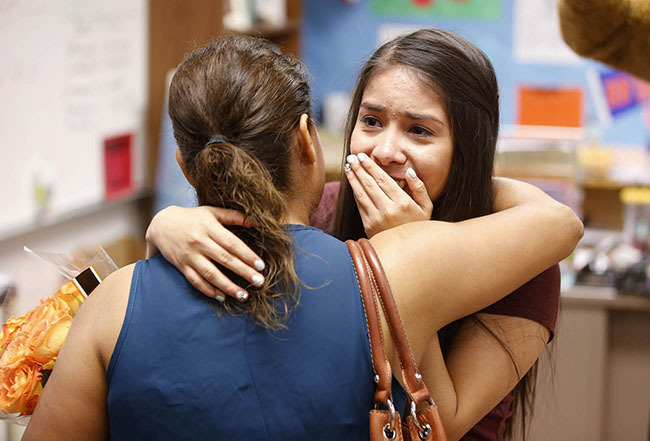 Denice Ledezma is overcome with emotion upon hearing the news that she is getting a Colangelo Scholarship to Grand Canyon University. The hug from her mother, Lucia, made it even more special. The class is called AVID. That stands for Advancement Via Individual Determination. It teaches students at Westwood High School in Mesa organizational and notetaking skills and helps them learn how to deal with an accelerated-learning environment. And it’s one of the many classes that Denice Ledezma has attacked with such, well, determination. Her reward arrived Monday morning, when she became one the Phoenix-area high school students granted a full-tuition scholarship to attend the Colangelo College of Business at Grand Canyon University. And her AVID teacher, D.J. Spetz, was equally determined to praise her. Later Monday morning at Mountain Pointe High School in Phoenix, Tierney Gallagher — who has shown an equal amount of determination — received her Colangelo Scholarship. Tuesday morning at Paradise Valley Christian Preparatory in Phoenix, Areina Wilson was the grateful recipient, and her family’s story is one of determination and faith that knows no bounds. 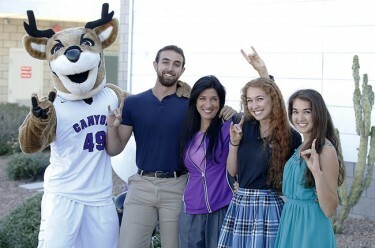 The Colangelo Scholarships are named in honor of Jerry Colangelo, the namesake of GCU’s business college who is known as much for his character, integrity and servant leadership as he is for his unmatched accomplishments in sports and business. Denice Ledezma is congratulated by the CCOB dean, Dr. Randy Gibb. 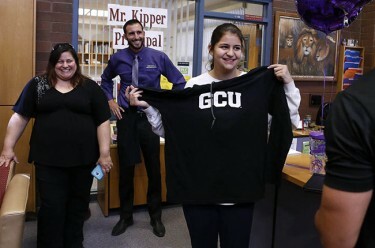 Ledezma, who had planned to attend GCU and just work her way through school, admitted the scholarship was a “huge surprise,” and there was no doubting that from the looks of her reaction. She broke into tears as the GCU contingent, led by Thunder, walked into the classroom and she realized what was going on. But she was very much in control of her interview for the scholarship. Dr. Randy Gibb, the CCOB dean, loved her demeanor in that situation. The lifelong Mesa resident said she got turned on to the GCU spirit when she attended a basketball game with her sister Dayana, who just graduated. Denice hasn’t yet decided whether to major in business administration or business finance. One thing’s for sure: She’ll work at it. 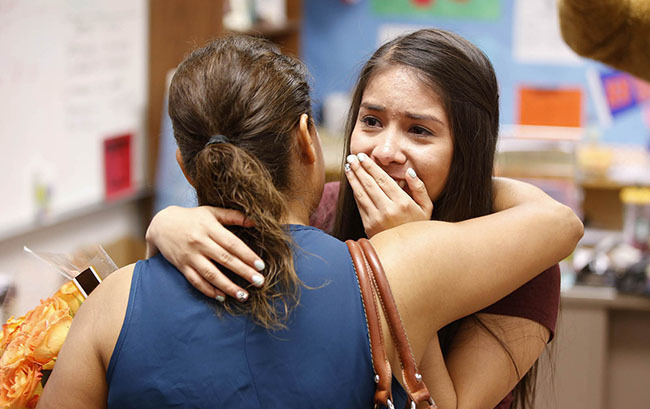 Her father, Ramiro, remembered all the times she would be up until 1 a.m. doing homework. “I’m very proud of my daughter,” he said. Tierney Gallagher shows off the new GCU hoodie that was in her goodie bag. That’s her mother, Elizabeth, at left. You want to talk determination? Gallagher showed hers last month when she went to her interview for the Colangelo Scholarship three days after having her wisdom teeth taken out. She could barely talk. “I just tried to be precise in what I said,” she recalled. Her parents, Sean and Elizabeth, said that tracks with how she handles her business – certainly an appropriate trait for a CCOB student. She booked the Colangelo appointment herself, and nothing, not even oral surgery, was going to keep her from it, just as nothing was going to keep her from getting involved in high school. One of those was the Chefs Club, of which she was president. She concentrated on culinary classes at Mountain Pointe, attended the East Valley Institute of Technology for a year and a half, and wants to study hospitality management at GCU. Her full name is Tierney Patricia Gallagher. Her dad is Sean Patrick Gallagher. But Sean and Elizabeth have raised their three daughters to rely on themselves, not just the luck o’ the Irish. Thunder is joined by the Wilson family (from left): Jacob, Dorina, Areina and Desiree. Like Ledezma, Wilson was shocked when a surprise outdoor assembly was called 10 minutes before the ceremony and then she was called to the front. “I’m really surprised that I got it. I’m really excited,” she said. The news came a day after she was told she will be the valedictorian at graduation next week, and it’s an equally huge blessing for her mother, Dorina, a single parent who was working three jobs when she became the Paradise Valley Christian physical education instructor in February. Dorina got the call about Areina’s scholarship Friday and was sworn to secrecy. “All weekend I was on pins and needles. I probably lost three pounds,” she said. Also in on the secret were her other two children, son Jacob and daughter Desiree, so they could be there, and their presence made it readily apparent that this is no ordinary parent. Jacob graduated from GCU and now is working on his MBA, and Desiree also was the PVCP valedictorian and now attends Arizona Christian University next door. Anyone who has raised children alone can identify with her story – and her strong will. Dorina tells of living in the back of her parents’ house for four years (“I thought it would be a year”), cleaning houses with the help of her kids to pay the food bill and using tax-credit dollars to keep her kids at a private Christian school she considers part of her family. She’s so excited about Areina’s college choice, she wants to recruit for the University and even get a degree from GCU. She even talks about adopting a son — her kids asked her to — but plans to be at PVCP, which Areina has attended since preschool, for a long, long time.